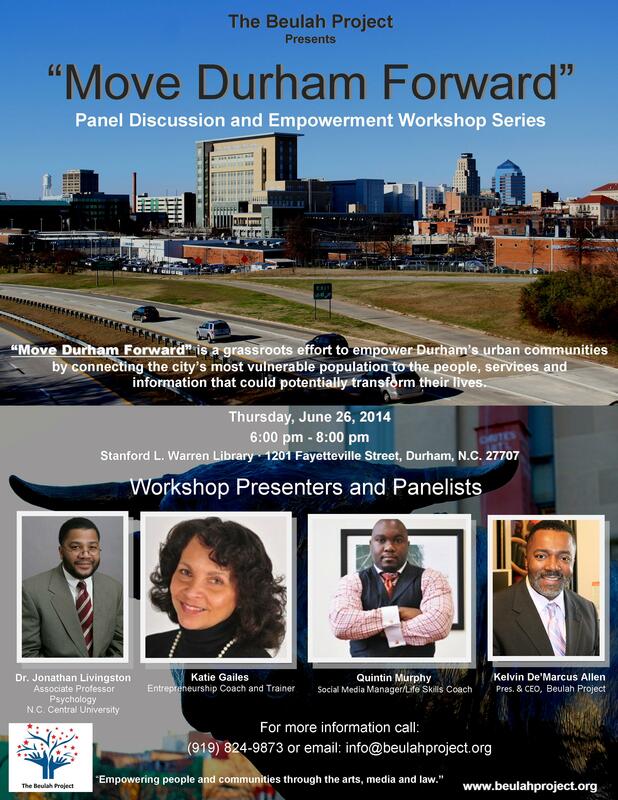 DURHAM, N.C. – The Beulah Project, Inc. a Durham based non-profit organization will be hosting “Move Durham Forward” – Panel Discussion and Empowerment Workshop Series at Stanford L. Warren Library, 1201 Fayetteville Street in Durham on Thursday, June 26 from 6:00 p.m. – 8:00 p.m.
Durham, NC has eight (8) tracks representing 2400 citizens in its urban profile considered by a recent study called North Carolina’s Distressed Urban Tracts: A View of the State’s Economically Disadvantaged Communities by UNC to be poverty impacted and distressed. Mayor William Bell has developed a 2014 plan to address poverty reduction through listen sessions and task forces. He will focus on attacking root causes and contributing factors to poverty in six related areas: education, healthcare, jobs, public safety, finance and housing in an ongoing and targeted effort. 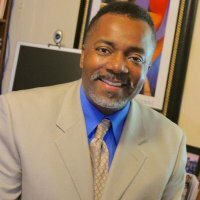 According to Kelvin Allen the Beulah Project founder, “Move Durham Forward” is a grassroots effort by the organization to empower Durham’s urban communities by connecting the city’s most vulnerable population to the people, services and information that could potentially transform their lives. “ Very often those who reside in distressed communities are not aware of the services, resources or the people who can help them. We want to change that,” Allen said. “One of the main goals of this panel discussion and workshop is to to bridge the gap that exists between the people who need assistance, and the organizations and people in place to assist them. One would think that it is no-brainer, but like anything else in life, sometimes folks get too comfortable in their own environment and it takes just this type of event to get folks moving,” said Allen. Panel participants include, Dr. Jonathan Livingston, an associate professor of psychology at North Carolina Central University, entrepreneur coach and trainer, Katie Gailes, social media manager and life skills coach, Quintin Murphy and Allen who will also participate in the panel discussion. Representatives from the N.C. Institute for Minority Economic Development, Public Allies of N.C., Carolina Outreach Mental Health Services, veterans service representatives, as well as, a host of concerned citizens. The event is free and open to the public. “We all have a vested interest in making sure Durham’s urban communities have access to the resources a city like Durham has to offer. “Move Durham Forward” is simply The Beulah Project’s way of answering Mayor Bell’s call to reduce poverty neighborhood-by-neighborhood, year-by-year,” Allen said. For more information contact Kelvin Allen at (919) 824-9873 or e-mail: info@beulahproject.org. The Beulah Project utilizes the arts, media and law to empower people and communities. To develop and foster leadership skills in youth and adults, and to utilize the arts, media and law to empower people and communities. 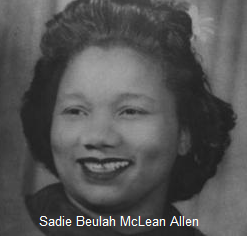 Established to honor the memory of Sadie Beulah McLean Allen (1920 – 2004) who distinguished herself as a mother, missionary and charitable giver. Born in Parkton, N.C. in 1920, Allen’s life was a testament to perseverance and faith. Although Allen’s own dreams were often put on hold or never realized, Allen’s dedication to raising her family, her encouraging nature, and anonymous giving assisted countless others in pursuing and accomplishing their goals. The Allen family maintains a steadfast love for North Carolina and the City of Durham. The Beulah Project’s mission is to empower people and communities through the arts, media and law. The Beulah Project is dedicated to supporting progressive civics, arts and educational projects that empower people and communities as we are called. Our objective is to provide technical and Christian support support as they strive to reach the very highest potential of our rich and priceless American dream. To learn more visit: www.beulahproject.org.